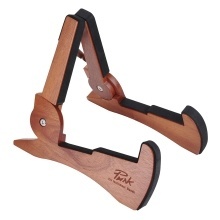 Universal guitar stand, made of mahogany solid wood, durable and sturdy. The contact parts between the stand and the instrument are covered with soft foams, anti-slip and no scratch to you instrument. Cute rabbit shape with smooth surface, exquisite workmanship. Foldable design, convenient to store and carry. Ideal for storage and exhibition of electric/ acoustic guitars, bass and other string instruments. The guitars showed in the pictures are not included.